Yahoo is lumbering into the app search game, years behind smaller, nimbler competitors. A new website called Yahoo App Search indexes iPhone and Android apps, and an iPhone app called Y AppSpot provides personalized recommendations and a search function. But as I played with these search tools, I couldn't figure out why anyone should use Yahoo's new apps instead of the many other app search options available. Neither the website nor the iPhone app bring anything new to the table. 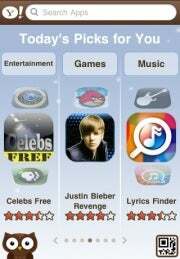 Y AppSpot's big hook is supposed to be personalized recommendations based on the apps you already use, which led me to wonder why "Celebs Free" and "Justin Bieber Revenge" were among the apps Yahoo wanted me to try. At least the iPhone App Store's built-in Genius function tells you which app it uses for the basis of each recommendation. Beyond Yahoo's recommendation engine, there's little reason to use the app instead of the native App Store. I do like the "more apps you'll love" option for each app, which opens a list of similar choices, but the options for discovery are otherwise pretty barren. If you want more ways to find cool iPhone apps, check out Appsfire, which tracks price drops and uses Facebook and Twitter to find popular apps. For finding discounts, I like AppShopper and AppMiner. Yahoo's App Search website does fill a void left by Apple, which doesn't have a central location on the Web to search for iPhone apps. But as with Yahoo's iPhone app, there are no tools for finding discounts or discovering what's popular at the moment, as you can with Appshopper or Appsfire, respectively. And for basic search, I prefer the interface of Chomp, which shows a screenshot for every search result instead of just an uninformative app icon. Again, the "more apps you'll love" option is Yahoo's saving grace, but it's not enough to stand out from the competition. For Yahoo, getting into the app search game makes sense. On mobile devices, apps replace many functions of a native browser, so indexing apps is a forward-thinking move. But for now, at least, other websites and discovery apps are several moves ahead.